Uttar Pradesh Subordinate Services Selection Commission (UPSSSC) had invited applications to fill up 694 Posts of Yuva Kalyan Adhikari/ Youth Welfare Officerin Yuva Kalyan & Prantiya Rakshak Dal Vibhag. The Process of Submitting the Application form is Started from 13.03.2018 & Conducted Till 17.04.2018. The Application form Process is Conducted Online and A large Number of Candidates filled there Application Form. All the Candidates Successfully submitted there Application form and Now they are waiting for there Exam. Soon the Exam will be Conducted and The Date of Examination will be Announce on the Official website of UPSSSC. The web link for download the e-admit card of UPSSSC Yuva Kalyan Adhikari Exam for Written Exam will be provided Soon on the UPSSSC Official website. 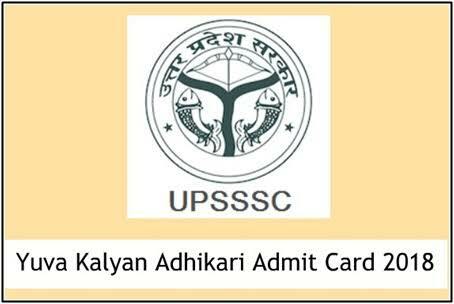 Candidates who applied for this Competitive Exam should download their E-admit Card or Hall Ticket to enter in prescribed Exam Centre of Exam by UPSSSC. Enter the required credentials like Date of Birth, Enrollment Number to log in. Verify the entered details before submitting. A new page will open displaying the Vikas Dal UPSSSC Admit Card 2018. At last, take a print out of Uttar Pradesh SSSC Exercise Trainer Admit Card.